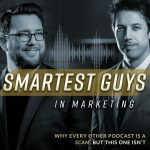 In this episode, special guest and client Tim shares his story as to how he started working with Chris & Taylor, turned his dreams into reality and how he has now taken his business to new levels he never thought would be possible. Not only that, you’ll hear Tim’s honest thoughts about what it’s really like to be a client inside the Traffic & Funnels ™ community. A ‘must-listen’ episode if you’re serious about leveraging, protecting, and sustaining the long-term health of your business. Previous post: What happened to your sense of adventure?